Category: Characters, Girls, Princesses, Princesses & Royal Highnesses. Posted in Characters, Girls, Princesses, Princesses & Royal Highnesses. Tagged as Glitter Princess, Travis Designs, Wand. 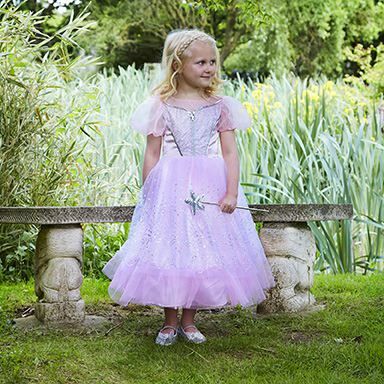 A magical pale pink princess dress with silver glitter detailing, complete with a silver sequin star wand accessory. The silver sequin trim and braid define the sweetheart bodice and match the delicate glitter printed feature hemline.